WARNING: This is going to be long but, if you want to learn more about our system, you’ve come to the right place! WARNING: This is going to be a long read, but if you want to learn more about our Pacers Bikeshare system, you’ve come to the right place! Thank you for taking our 2017 Annual Member Survey. We want you to know, we hear you! Our Pacers Bikeshare Operations Manager has answered some of the most frequently asked questions and feedback you provided us last fall. Some of them we have answers and suggestions for and for others, we want you to know, it’s on our minds too. We want to be transparent and let you know, we’re a public bike share program and we’re doing our very best to keep all of our riders happy and maintain the quality of our system. Check Out a Bike: Do you find wallets passe? Things in your pockets annoying? Use the BCycle app to check out a bike like magic. Log into the app, stand by a bike, and tap “check out a bike”. Roll. 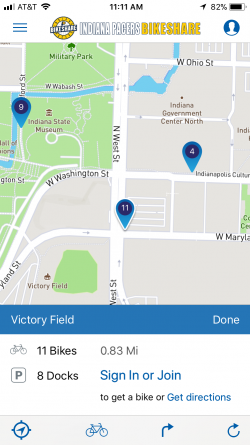 Bike/Dock Availability: There is a live map of all of the stations in the Pacers Bikeshare system, and you can view them by bikes or docks available (just like you can on our website). This removes the guessing from trip planning. Trip/Calories/Mileage Tracking: Where have I been? How many miles did I travel this week? How many donuts do I have to eat to cover that crazy ride? All of these can be answered within the BCycle app. Mapping: Directions are available to get you to a station, as well as from station to station. Note: BCycle is our equipment provider…one of our favorite things about BCycle is that it’s parent company is Trek Bicycle Corporation. Yes, all of our bikes are Trek bikes and go through the same design process, quality assurance and safety testing that any Trek Bike goes through. Pretty cool. Here’s what we’ve got: The BCycle App will provide turn by turn directions while the program is open We are 90% confident in these directions however, if you don’t feel comfortable on the recommended route, get a second opinion. Here are some alternatives that might work for you: Google Maps | Map My Ride | Bikemap.net. And in case you haven’t figured it out yet, if you use the Indianapolis Cultural Trail for your bike share journey, you will come across a station every block or so. We ALL want bike share in our neighborhood: This is the first suggestion on people’s lips when I tell them where I work, and your survey results are no different. It’s one of the first things on my mind and a matter often discussed among our team. The good news is, we have successfully secured a federal grant that will allow us to expand in a major way starting in 2020. You may remember we had public input sessions in 2016 that helped us with our expansion planning efforts in advance of the grant application. That wasn’t your only opportunity to provide input…as 2020 approaches, we will have several more opportunities for you to help shape our Pacers Bikeshare 2.0 map and we will want your input. 2020 will be here before we know it, but we don’t want to wait that long to add to our system either. We are always on the lookout for private and philanthropic funding opportunities and partnerships for adding stations. You may not remember, but when Pacers Bikeshare opened in 2014, we had only 25 stations…we now have 29. Our new stations have been added through funding partnerships with employers and property owners. If you think your employer or apartment building may be interested in having one at your building, please let us know. We’d love to have a conversation. Station Density Each of our 29 stations is a part of the larger system. Bike share systems work best when there is a dense network of stations in close proximity to each other so that the system can be balanced and provide multiple options for bike and dock availability. If it becomes too full or empty, for example, a person needs to have a station close by to have options. To be specific, a Broad Ripple expansion would require more than just one station in Broad Ripple for it to work well and as the system is designed. We will get there, I promise, and soon. Bike-friendly Infrastructure: It has been shown around our country and the world that when we build the infrastructure, we will ride. Bikeways of all kinds are what it takes for folks to feel safe on a bike. It’s that simple. Fortunately, we have the Cultural Trail that connects to more than 50 miles of greenways and trails. 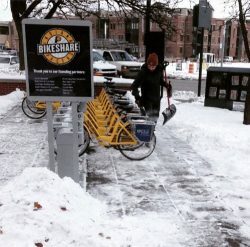 Indy is becoming a lot more bike friendly and there’s still more to come. 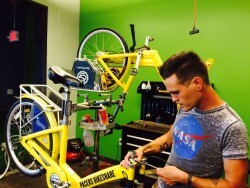 One of the primary reasons why Pacers Bikeshare has so many people riding is because they feel comfortable and safe riding on the Indianapolis Cultural Trail…and the system is dense, easy to use, has well maintained bikes and fantastic customer service. 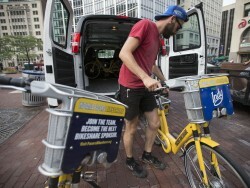 In conclusion, Pacers Bikeshare will grow. Thank you all for your continued patience. It is going to be amazing. Tires: After performing trials with various models, I’m happy to report that we have selected a new tire! We are confident in the ride quality, durability, and air retention of the new tires. You’ll be seeing those out on the bikes and having comfy rides on them. Tire pressure is a constant task for our team. Temperature and atmospheric changes, load, and the porosity of rubber dramatically affect tire pressure. We now have air pumps galore and are going to be arming volunteers with these green machines to go forth and inflate. Long live the Air Brigade! Bells: If I had a nickel for every bell striker we have replaced…which is why the manufacturer of our bikes has recently redesigned the bell! You’ll be seeing these on the road as soon as we get our paws on them and kick them around a bit to make sure they’re the best. The design is twist activated, like the shifter on the bikes, and seems robust. Please let us know what you think after your first couple of rings. Saddles: Torn saddles and wet bottoms have become an issue. We began replacing these in earnest in the last six months, with plans to replace 50-100 more in 2018. This ain’t no Cohen brothers movie, so no more soggy bottoms! Look for Bike Returned message upon docking a bike. Fill out the form, and do a dance! Let us help you: One of the greatest things you can do to enjoy comfort and power on a bicycle is to have the saddle set to an appropriate height, and the clamp to an appropriate tightness to keep it steady. Check out this video to see how it is done! An $80/year annual pass works out to about $6.70/month, $1.50/week, or $0.22/day. What?!? Are we crazy!?! No folks, we just love to use bike share. bikes. Seriously, though, I cannot think of another form of transportation that even approaches the affordability of those prices.The value of the Annual and Monthly Passes is increased the more you use it. 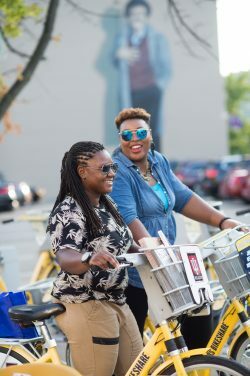 “EveryBody Rides” is a program of Indiana Pacers Bikeshare that provides an opportunity for EveryBody, regardless of gender, age, race, income level, shape, and size to have access to the gold Pacers Bikeshare bikes in downtown Indianapolis. 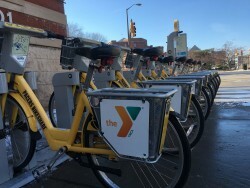 ICT has partnered with Indiana Housing Authority, Volunteers of America, and other low-income based organizations and residences located in close proximity to the bike share stations to offer subsidized passes for Pacers Bikeshare. Qualifying individuals are able to purchase a subsidized annual pass for $10, a $70 reduction in cost providing an affordable and reliable form of transportation. EveryBody Rides members will have access to all 250 bikes at 29 stations located on or within a few blocks of the Indianapolis Cultural Trail. Monthly passes are available for just $15 – a great option for those who want to use Pacers Bikeshare during the warm months. We offer Corporate Passes and bulk rates to businesses who are interested. As far as discounts, we don’t provide discounts to any companies as we feel like bike share is one of the most affordable modes of transportation in the city! Sit down, we’re going to get nerdy: If you’ve seen our van and guys (no gals yet…) in yellow vests moving bikes, this is called ‘balancing.’ When a station has too many or few bikes, we send them out to adjust. During commuting hours specifically, our balancing follows the natural patterns of the riders. In the morning, people ride into the downtown core area. There must be empty docks in the core at that time, and plenty of bikes in the outlying residential areas. The reverse of this is true in the evenings. Lunchtime can be somewhat unpredictable, though, on the whole, you seem to ride bikes around a bit, then take them back to where you started. In the evenings, Mass. Ave. and Fountain Square / Fletcher Place tend to fill up. During large conventions, weekends and ball sporting events, the Georgia Street area gets busy. We keep an eye on things throughout the day to accommodate these trends. Yes, we’re typing these responses with a scarf on: Winter in Indiana, with its shortened days and overcast skies bring reduced sunlight. Roughly half of our bike share stations are solar powered, with battery backups that are charged by the sun. When these batteries do not receive enough power due to reduced sunlight, we have station outages. Where possible, hardline power is used to provide energy to the stations. To combat station outages, we have a reserve of batteries we charge in our operations center.